Female cats h lust first time at age 7-8 months or 10-11 months. Period lasts for 7-10 days lust and lust cycle will be repeated after one, 2-3 months. Sign of lust among other female cats to be heavy and loud noise, like rolling, aggressive, and decreased appetite. Female cats should not be married before the age of 1 year with a minimum weight of 2.7 pounds. Owners need to pay attention to the onset of breeding pyometrasehingga causing delays up to several times. pyometra is an infection of the uterus due to accumulation of the hormone progesterone, which resulted in a thickening of the uterine wall are equally harmful bacteria to grow. In case of pyometra, the uterus must be taken to avoid death. 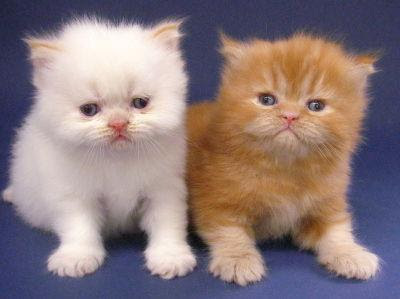 Persian cat owners should always pay attention because this cat health a top priority before deciding to re-breeding. Female cats during feeding and raise her children before her son off weaning (age 3 months) should not be married first. Minimum formula for re-breeding period is 3 months + per month from the number of children who are born and nursed. The purpose of vaccination is that the child is born can get good nutrition from the parent that is free of disease, so it can anknya fat and healthy. The objective of de-worming is that kittens born to be free of worms. Before breeding, the female cat should be ensured in good health, not skinny, leather and fur is not problematic. The goal for the marriage and the birth process went smoothly, then the child is born do not have problems due to contracting the disease from its mother. Tomcat just checked as usual (general checkup).